As Project Zephon's case has showed us, multiplayer arenas if constructed properly may translate to single player quite efficiently. 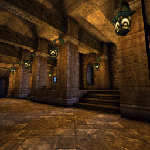 Konosus: The Secret of Minos, originally a deathmatch map from 1999, revisited ten years later by the author and a person called W3RM, just might be one such map. Is it? Wey's original design technique certainly helps in that regard. As the author himself acknowledges in the release notes, he aimed not for a typical fragfest arena, but for a setting and this made it easier to turn the level into a single player endeavor which turned out quite neat. One of the castles from a distance. Konosus is a fairly large map with a river running through the center of the area. This river is blocked by a dam with two castles nearby. The player's task is to clear out the castles on both sides of the dam and find a way to the top of the rock formation surrounding the entire valley where the destination camp is located. That's all there's to it. And with no story implemented it may seem pointless. But it really isn't. The visuals themselves are awesome for a 1999-era map. The castles, boasting new textures look realistic and fresh. The little details like a steamy little cloud at the waterfall or rundown machinery at the basement, or finally the small library that makes the player feel like home are a feast for the eyes and with the lighting, while not perfect, still good enough not to spoil the impression, the level is one of the better ones out there. There's also a lot to hear in Konosus. The ambient layer is pretty rich and adds to the enchanting feel of the level and the Unreal Crypt tune fits the location like a glove. The rundown machinery in the basement. The gameplay factor is the toughest part to pull off when dealing with MP-to-SP porting. As a solo adventure usually revolves around searching for a way to unlock the next portion of a location by doing something in the previous area, leaving too many routes open might prove problematic. That is not the case with Konosus however. The level is fairly linear but each main location can be accessed by at least two ways and all have their advantages and disadvantages. For example, if you use the teleport to get to the second castle, the Skaarj troopers patrolling the premises will sooner or later spot you anyway and just might enter the interiors and engage you up close. On the other hand taking the bridge makes you fair game for the snipers while giving you enough room to jump around, avoiding shots. Enemies are plentiful but so are weapons and health provisions. Seemingly there's no concern here for gameplay balance but the players may be surprised or even frightened of entire teams of Skaarj charging. However in those cases you just might realize how useful might the Eightball Gun's regular spread shot mode be. When I saw the squad on the bridge charging at me, I deployed a full set of six missiles at them and watched the gibs fly. Only two of the opponents remained but those were quickly picked off from behind cover. Earlier, the player encounters a titan. It might prove tempting to waste as much ammo as you can on the beast, but I beseech thee - touch it not! A much better idea is to provoke the Skaarj troopers around to either attack from distance and hit the titan accidentally or close in on the player and get hit by the rocks thrown by the monster. It may be tricky but it is doable and shows the authors' mastery at orchestrating the entire thing as it forces the players to utilize their surroundings instead of mindlessly firing away at everything that moves. This isn't pure excellence but in my opinion it's pretty damn close. The authenticity of the location combined with the challenging, frantic and yet well balanced gameplay make this level a truly great experience and while lack of a storyline does sting a bit, it's not a valid reason to skip this level. Strongly recommended. The library. Now that the intruder is dead, it feels like home. Last edited by Delacroix on 19 Nov 2013, 01:13, edited 3 times in total. I love DM-Konosus][ for UT, I guess I should check this out because I never knew there was an SP version. This is more of a general statement, as other reviewers/reviews on the site do this as well, but just based on the picture the descriptions in the review build in my mind I object to the zero story score for a map like this; it might not have an overt story, but in any map with attention paid to it, like this one seems to be, the player's journey and interaction tells a story. Perhaps it's not one worth more than one or two points, but a level with any obvious effort put into it inherently tells a story even if there's no text, character interactions or/and readme stories. Objection has been noted, however when the visuals allow one to figure out the story or purpose then it is warranted to lift the score up. However beautiful and epic, Konosus features none of that, I am afraid. Delacroix wrote: Konosus is a fairly large map with a river running through the center of the area. This river is blocked by a dam with two castles nearby. The player's task is to clear out the castles on both sides of the dam and find a way to the top of the rock formation surrounding the entire valley where the destination camp is located. That's all there's to it. And with no story implemented it may seem pointless. This is the main paragraph that stuck out in this regard; perhaps there's no textual backing in the map for this, but it's obvious that some sort of story, setting and progression can be obviously inferred from your interactions with the world (as opposed to, say, a map that's nothing but randomly textured cube arenas and requires massive leaps of logic to make up a story for it), even if those things are very basic. Very well. 2 points added to Story Construction, but nothing else and that's final. It sounds like those points would fit better in implementation rather than construction (how the story is conveyed by the level rather than the backstory), or even one in each, but okay. Admittedly that's more of an issue with the somewhat fuzzy and subjective distinction between those two story categories on the schema. After consideration I decided to up the score for one additional point. Moved the 2 points to story implementation through level construction as you suggested and gave one for the "Secret of Minos" part in the readme which while short, vague and hardly really relevant, IS there and thus deserves a point in construction. I started this map yesterday evening thinking - let's have a quickie, but it turned out to be a medium-long session. I'l be short but straight to the point : how on earth did this map remain hidden all these (12) years? It's a must play, and just forget about the few errors. Visually very entertaining (the start of the level especially) and gameplay-wise somewhat challenging at times (but never unfair). As Delacroix' review points out, the Titan can be a serious ally in the beginning. Using the DP from the starting location (outside) look for enemies in the distance and attract their attention, and then a bit later go down and lure them into the Titan's area. Dead Skaarj will provide the player with a needed supply of ammo. One of the very nice properties of this map is that the Skaarj do a pretty good job of moving around (even following the player through the teleporter) so don't get comfortable and think a previously secured area is still safe. The ending didn't work for me (but I probably missed something somewhere). I went up to the second tower, realised something could still be done (the sound was a giveaway), did that a got into a fight with 5 or 6 Skaarj and found a pillar with a voicebox on it, but no way to reach that voicebox. 15 minutes later decided to quit before agitation got to me. Thanks for doing this....it made me download just to find out the name of my favorite Robert Wey map, DM-FourthOrder - been looking for it for a while and never could remember the name of it. Robert was a fantastic mapper who never got as much pub as I thought he deserved. Anyone still got this file? StalwartUK wrote: Anyone still got this file? Edit: This level won't work in UT. Trying to do so results in a "Can't find BoolProperty in file 'BoolProperty Engine.Weapon.bTossedOut" error message, probably due to the "UPakGuns" package included. Runs fine in Unreal 227 and presumably earlier Unreal versions too. Replayed this very pleasurable map and found it relatively easy on Hard (only the beginning is a bit troublesome due to lack of weaponry but using the "right" strategy it doesn't take too long. After about half an hour I jumped to the almost top area (with the 5 or 6 Skaarj and voicebox) and usng the jumpboots got the voicebox. Unfortunately the jumpboots aren't enough to get to the top area with the tent which seems to be the end. Had a look in the editor and saw a small square which seems to be a mover with a tag "magicCarpet" so I guess that must be it, but after 15 minutes of searching in the editor I gave up. Can someone with better understanding of the editor (almost all of you guys I guess) have a look at it and explain how to end this map as it's supposed to end? pics don't show up unfortunately... Could some one replace? Please?